The Thursday night game between the Broncos and the Roosters was so packed with drama that Friday night’s match between the Knights and the Bulldogs initially seemed destined to be a disappointment. What a great surprise it was to be treated with one of the most entertaining games that either of these teams have played all season. 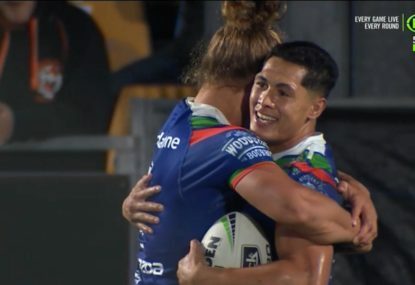 This was a terrific three-act drama which started with Newcastle resurgent, then shifted to the Canterbury young guns taking centre stage, and ended up with the Knights almost resplendent in the final minutes. From the outset, it felt as if this had the potential to be a turning-point for both the Knights and the Dogs. On the one hand, it was Newcastle’s first Friday night game in close to three years. More importantly, perhaps, as half time drew near, it looked to be the first time that the Knights might manage to keep the opposing team to nil over the first half since Round 10 in 2014. 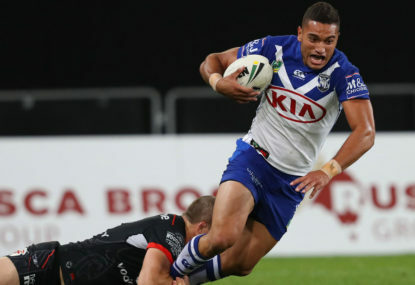 On the other hand, the Bulldogs have lost their last two matches, meaning that this also threatened to be the first time in the modern NRL era – since 1998 – that Canterbury hadn’t scored in three consecutive opening halves. With the stakes high for both teams, the Knights really started to apply pressure towards the end of the first stanza, in what initially appeared to be a critical turning-point in their journey back from 2016. As one of the key momentum-builders in the Newcastle side, it was fitting that Nathan Ross almost put down the first try of the game at the six-minute mark, only for the Bunker to discern a knock-on and put the Knights back down to zero once again. Fifteen minutes later, Ross made up for it with a brilliantly acrobatic try that saw him literally spin in the air after a low tackle from Marcelo Montoya only to land ball-first in the left corner. 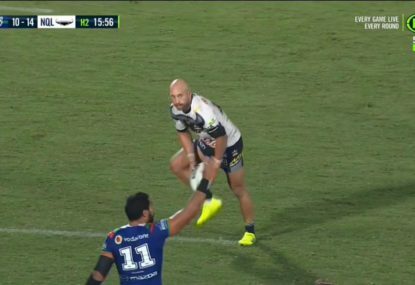 More on Montoya in a moment, because it’s worth briefly noting here that both Ross’ disallowed and successful try were set up by Trent Hodkinson. 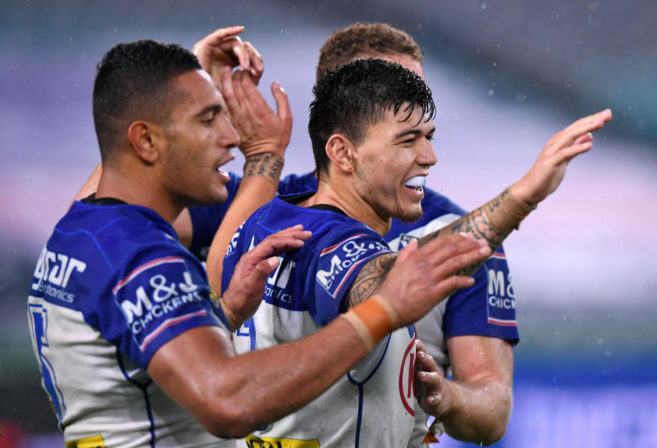 While his kicking game still requires some finessing, Hodkinson nevertheless put in one of his most emphatic presences on the field this season, at least in terms of issuing order and organising the other players. 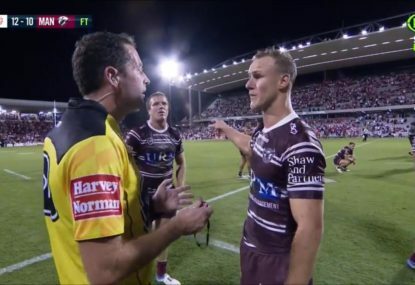 People tend to give Hodko a bad wrap when he’s below form and kind of ignore him when he’s playing competently – a truncated Origin career will do that to do – but tonight he was frequently where he needed to be, both in terms of leadership and positional play. However, if this initially seemed to be a Newcastle comeback narrative, Knights fans were left with their hearts in their mouths after Brenko Lee scored his first try for the Bulldogs three seconds before the halftime siren. It was a brilliant piece of play that culminated a series of intercepts and dropped balls that had seen the action zigzagging from one end of the field to the other in the final three minutes of the first stanza. Taking advantage of the chaos, Lee made his mark and prevented the Bulldogs making unwanted history with three consecutive zero-point first halves. If anything, Lee replaced that possibility with a different kind of historical turning-point, since up until this moment he was the only member of the Bulldogs backline who hadn’t yet scored a try. With Matt Frawley putting down his own first try for Canterbury-Bankstown less than a minute after halftime, it suddenly felt as if the focus had shifted from the up-and-coming Knights to the up-and-coming Dogs – and, specifically, to the younger and newer members of the Canterbury-Bankstown lineup. After all, Frawley was only playing his second game for the club, and yet his performance only got better, as he compounded his try with a brilliant try assist that saw Brent Morris putting down the easiest four points of the night. Having run half the length of the field to score after half-time, Lee set Morris up with an elegant pass that showed just how dangerous he could be if he ever takes on a place in the halves for good. Opting for a spin-free ball, it was a classic, old-school pass – clean, perfectly timed and poised as elegantly and symmetrically as the harbour bridge, clearing a whole swarm of Newcastle defenders in the process. More than an argument for the Bulldogs’ young guns, it felt like an argument for Frawley as a permanent fixture in the halves. At the very least, he was playing as if he were a permanent fixture in the halves, and that level of conviction was just what Canterbury-Bankstown needed to hold their own against such a determined Newcastle side. By the same token, Marcelo Montoya managed to get in two tries over second half, including the final try of the night, which occurred as close to the final siren as Brenko Lee’s had come to the halftime siren, sealing the deal for a new generation of Dogs players. Yet things momentarily seemed as if they were about to take on a new dimension with Dane Gagai starting what initially appeared to be a third and even more dramatic act to the drama. 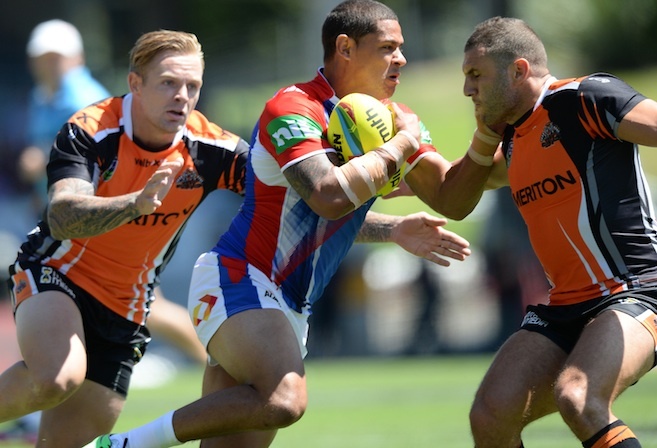 Throughout the game, Gagai had been outstanding and – even more than Ross and Hodkinson – the driving engine behind the Newcastle push. No player can generate momentum in quite the same way as Gagai, thanks in part to the terrific combination of speed, dexterity and defensive aptitude that can allow him to make line break after line break and bring in try after try when the conditions are right. 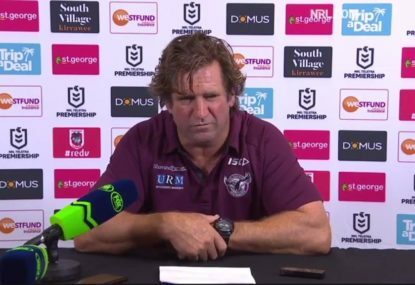 Daly Cherry-Evans was understandably not happy when one of his team mates was taken off the ball, but his coach will seek clarification from referees boss Bernard Sutton. The Warriors star produced a moment of his very best against the Cowboys.